Synopsis: Thomas Cale has been running from the truth.Since discovering that his brutal military training has been for one purpose - to destroy God's greatest mistake, mankind itself - Cale has been hunted by the very man who made him into the Angel of Death: Pope Redeemer Bosco.Cale is a paradox: arrogant and innocent, generous and pitiless. Feared and revered by those created him, he has already used his breathtaking talent for destruction to bring down the most powerful civilisation in the world.But Thomas Cale is weak. His soul is dying. As his body is wracked with convulsions he knows that the final judgment will not wait for a sick boy. As the day of reckoning draws close, Cale's sense of vengeance leads him back to the Sanctuary - and to confront the person he hates most in the world. Finally Cale must recognise that he is the incarnation of God's rage and decide if he will stand against the Sanctuary of the Redeemers and use his unique skill of laying waste to all things.The fate of mankind rests on Cale's decision.The Beating of his Wings is the third and final instalment in Paul Hoffman's epic Cale and the Sanctuary of the Redeemers trilogy, following The Left Hand of God and The Last Four Things. Phillip Pullman's His Dark Materials meets Umberto Eco's Name of the Rose, and fans of epic heroic fiction will love this series. Thomas Cale, Left Hand of God, God’s vengeance on humanity, is not what he once was. His strength is deteriorating, his soul thinning; his quality of life, in general, is at an all-time low – even compared to his time with the Redeemers in the Sanctuary. But with the uncertainty of his survival, Cale is even more desperate to return from whence he came – and kill his once-champion, Pope Redeemer Bosco. It’s taken three books but I think I finally, finally, appreciate Paul Hoffman’s deliciously written epic. What was at first revulsion (just read my review of The Left Hand of God), and then understanding (see my review of The Last Four Things!) has now become not just appreciation but out and out enjoyment of this epic trilogy. Again, Hoffman’s omniscient narrative voice is superbly laconic in The Beating of His Wings, his authorial commentary dripping with sarcasm and simply marvellous to read. 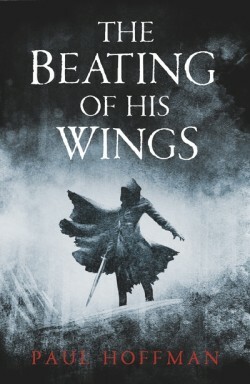 What got me, though, is that Hoffman chooses to end the trilogy in The Beating of His Wings in a far from predictable manner – unlike other authors, who build up to epic, continentally sized battles, Hoffman does almost the reverse, reflecting Cale’s fall from physical strength and entering the realms of political umming and aaahring, ending in a perfectly orchestrated anti-climax that is both fitting and full of bathos. Cale remains one of the best anti-heroes I have encountered in literature, full of contradictions: he is both innocent and experienced, brutal and yet fragile and most of all, he is continuously able to draw on our sympathies even when he’s being a really rather naughty boy. What did you think about The Beating of His Wings? You’ll also have noted the progression in quality of my writing, then…I have to be honest, my review of the Left Hand of God is ever so embarrassing now!